Blake Wilkes has never had a home he could keep. His family shifts between posh hotels, rented mansions, and stolen yachts, searching for the right Singer Compound and the living wax creature the Singer’s worship and create. One Waxling every sixteen years. That’s a heck of a lot of work for one wish. And a heck of an expense to find her. Money has never been a problem for the Wilkes. Not since their granddad stole a Waxling’s living seed heart and burned it while making a wish for money unending. However, no amount of wealth can stop death. Stall it, sure. But not forever. Blake’s mother is dying of cancer and the last chance to save her is if Blake steals the heart of the living Waxling. Problem is, the Waxling steals his heart first. The Waxling, a YA Contemporary Fantasy novel complete at 75,000 words, is a love story told through multiple points of view: the thief, the protectors, and the girl made of wax. It will appeal to YA readers who enjoy the magical characters of Helene Wecker’s The Golem and the Jinni, and the dangers of falling in love in Maggie Stiefvater's The Raven Cycle. My first published novel, Funny Tragic Crazy Magic has sold more than 15,000 digital copies. My second novel, Alchemy (Cowritten with Melanie Crouse and Sabrina West) made Amazon’s Top 100 Hot New Releases, and was rated # 42 in Indie Authorland’s Top One Hundred Self-Published Books Worth Reading. Sallow for strength. Beeswax for intelligence. Clay for humanity. Three drops of blood from the creature’s Maker. Take what cannot be and turn it into what has always been. Pour the mixture into a death mask, freshly cast. Leave the emotion in the plaster, the tears that came before the final blow, the fear, and the heartbreak. But remove all blood so none but the Maker will influence the wax. The flower Aechmea Simulacrum, culled back for the few, blooms only once in sixteen years. Four seeds survive the blooming. Two are planted back to the earth. One is saved in case the first seed fails, and the last is the soul seed. Carve the incantation on the soul seed with the knife used to take the life. Beware the blood. When the wax body is formed, but before it has solidified, place the soul seed into the Waxling’s chest and sing the words of the incantation. The Waxling will sing along with you. Be strong, its fresh cast voice has much screaming in it. My mom gave good advice. Excellent life saving advice. And I just ignored it like it was a reminder from my dentist. My throat was raw from swearing words I’ve only ever thought before as I swung my wild fists. My best friend Henry had his arm wrapped around my stomach, his arm steady but not tight, the way you’d hold a bird. But I wasn’t going to fly away. I was going to kill someone. I was more shark than a bird. Something with snapping teeth. Julius pushed Henry to the ground. Watch out for the Wicked. He mocked my whole life, my clothes, and my family, but I didn’t care until Henry defended me and Julius started in on him. And so what if Henry’s clothes were stale, and too short, or that he had acne and glasses, or that he followed the rules like he’d die if he didn’t? No one mocked Henry but me. I swung my fist again, this time not connecting with skin. Julius laughed once, a barking false laugh, as he ducked backward. He didn’t fool me. A flicker of fear was in his eyes as a trickle of blood seeped from his nose. “You’ll pay for that, Bedsheet,” he said as he wiped his index finger over his top lip. My fingernails dug into my palms. The Wicked will kill you first. They always kill the Protector first. 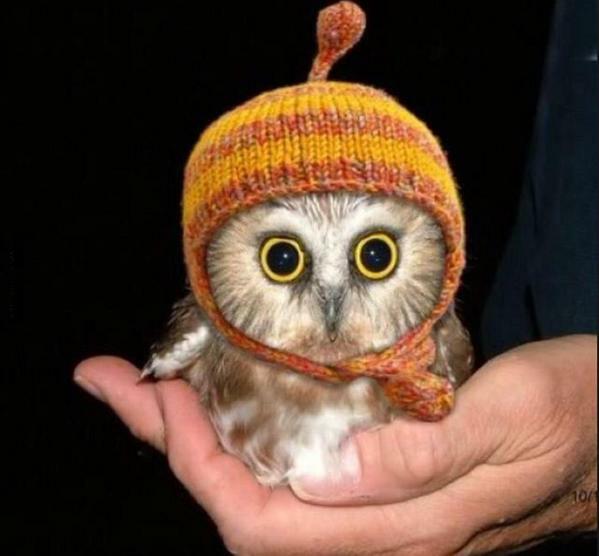 Because you just deserve to see a cute owl sometimes.